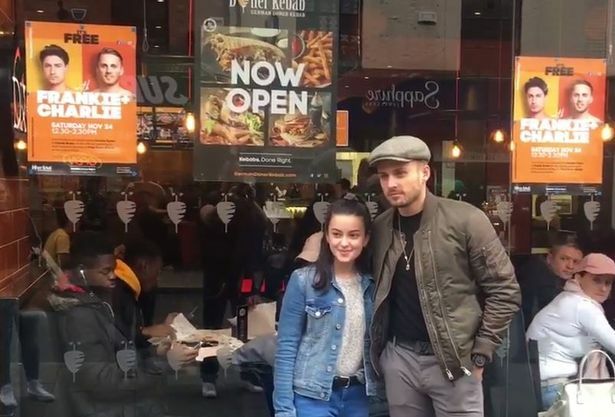 Reality TV favourites Charlie Brake and Frankie Foster will be guests of honour at Saturday’s grand opening of the city branch of a German Doner Kebab at 5-9 The Burges, Coventry city centre. They will be there from 12.30-2.30pm to meet and greet fans, pose for selfies and sign autographs. And to mark the occasion, the restaurant is giving away free doner kebabs to everyone who turns up to meet Charlie and Frankie. The hit ITV series gives contestants the chance to find romance in Majorca, with the victorious couple – as voted by the public – leaving with £50,000. The pair struck up a lasting friendship during their time in the Love Island mansion and are ready to sample the German-style kebabs. The free doner kebab offer is available between 12.30-2.30pm on Saturday, November 24. Love Island fans got to meet one of the show's reality stars as he came to Coventry. Charlie Brake was the guest of honour at the city's German Doner Kebab outlet as it held its official opening on Saturday (November 24). Charlie was all smiles as he met fans of the show and posed for photos at the restaurant in the Burges. And if that wasn't enough to keep people happy, then GDK was giving out free doner kebabs to customers - which led to some long queues snaking out of the door. Much was expected from German Doner Kebab when it opened its doors at the site of the former Cashino in the summer. The reason for the excitement came from the menu at some of the other 70 branches across the globe. Unsurprisingly, the signature dish is the classic doner kebab, but GDK do things differently, with the meat, salad and sauce homed in a waffle pita bread. And other menu items include a doner burger, doner quesadilla, a box of doner, or doner meat and nachos. There are also sharing options, and family deals available, along with a selection of salads.